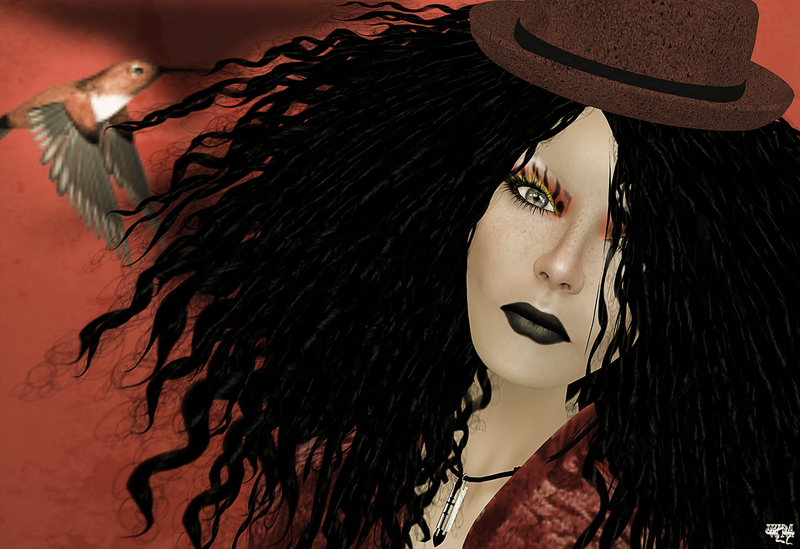 The 3rd Crazy Hair Hunt!!! ONCE UPON A TIME, not so long ago, there was a woman with a dream. FOREVER FOND OF THE ODD, colorful, interesting and unusual, she wondered why people looked so sad. Was it their perfectly nice and respectable – but muted hairs? Had nice – or even worse – boring hair sucked the spirit out of them? THEN LIKE A BLAST, it came to her! It wasn’t that they all had to be as one, it was that they had all forgotten how to throw caution to the wind. To be wild and free, to dance to their own tune like no one was watching, sing their own song, be a shepherd and not a sheep. To know they can be anything and not settling for less! Perhaps she could help them? Find others who could assist her in showing those restrained by the real world how to let out their inner Vivianne Westwood couture model, outrageous drag queen, ripped and torn punk rocker or squeaky and shiny cybernun? Perhaps they secretly wanted to be a cat/spider/demon or toaster? To not be afraid of new ideas and enjoy the madness of creation in all its weird and wonderful forms! SO SHE AWOKE and planned to seek out like minds to assist her. ACCOMPANIED by a marvellous bunch of trusty friends, she set about finding those capable of making brilliantly wild and crazy hair. Only specific makers were asked, because the team had to be sure they were worthy of the challenge ahead. They all laughed excitedly and said “Let’s do it”! Our dream becomes reality……….. yet again! 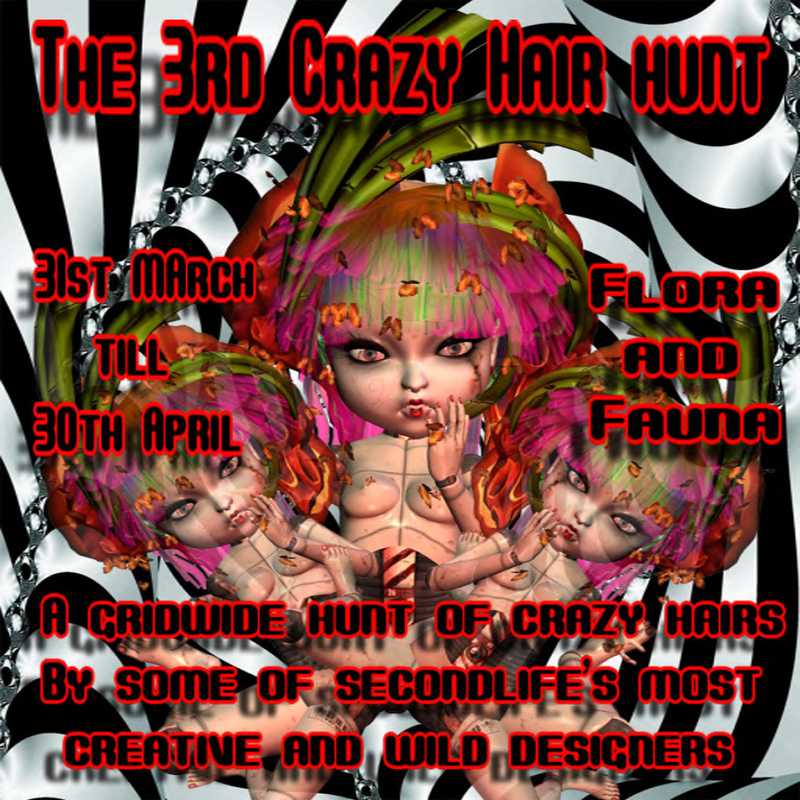 We bring you THE 3rd CRAZY HAIR HUNT ! The date is 31th March to April 30th………..
Thats ALOT of FABULOUSNESS over 60 shops! Hint: Seek the arrow and ye shall find! Hint: Closer than you think! Hint: The starter kit is the best place to start looking. Hint: If it’s too dark in here you might need this. Hint: Need a hint? Ring the bell for customer service. Hint: I wave in the sea, but no water is to be seen, so I stand still. Hint: Time to Dress up! Hint: 1. Quick! Follow that Ninja! just look up, and left, and have a gReat day! Hint: If you’re hurt, look in this corner to heal you. Hint: Not far away …….. Hint: Turn to the left. Hint: If you feel the urge to go for a swim, find a mermaid for a companion. Hint: Make beautiful in the mirror towards the hair on the 1st floor! Hint: ceiling art is the new thing. Hint: Can you see the Lily Pad? Hint: Relax , i am comfy! Hint: oh, I have a Rock stuck on my shoe..
no matter how swift the feet flew. Hint: Where the top models are, you will find. Hint: a good start in the day with a breakfast! Hint: Warning Blowdryer should not be submerged underwater! May cause DEATH by electrocution. Hint: I like bananas…because they have no bones. Hint: Bird is the Word. Hint: Please don’t snoop in my desk. *CHH3* 57 Weather! or not? Hint: Gotta try that SHROOM dude. Hint: Just take the first step. Hint: Why is the willow always weeping? Hint: Sit in front of the fireplace and toast marshies but keep them out of your hair!